Shipyard gantry crane is a highly efficient lifting solution designed to improve productivity of dockyards. It is capable of lifting and moving large blocks of hulls in the process of ship building or repairing. The shipyards gantry cranes fall in two main configurations including single girder and double girder. With regard to different running mechanisms, it can be divided into rail mounted and rubber tyred type. 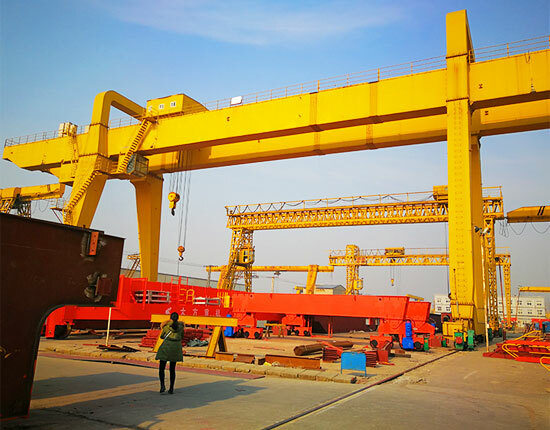 The shipbuilding gantry crane produced by Ellsen has numerous advantages such as superior quality, high rigidity, excellent safety and great flexibility. We supply a large variety of shipyard gantry cranes to meet different lifting applications of clients. 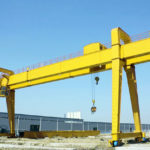 Here we strongly recommend two main types of gantry cranes widely applied in shipyard. Rail mounted crane is the most common type of lifting equipment used in shipyard. According to specific lifting capacities, it can be built with single or double girder. 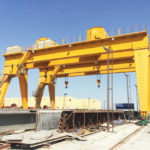 The rail mounted shipyard gantry crane travels on tracks mounted on the ground and is able to handle various materials from lightweight to large and heavy duty. The gantry lifting equipment can be built with outreach at both sides of main beam to form cantilevers, which can greatly increase the work space of the crane. Rail mounted gantry crane for shipyard normally adopts remote control or cab operation to ensure the safety of operators. It has many prominent features such as wide adaptability, high utilization, high productivity and durable performance. The rubber tired gantry crane is an ideal lifting solution to improve the flexibility and mobility in your shipyards. Instead of running on rails, this type of dockyard gantry crane is attached to rubber tires at the bottom so that it can moves anywhere within the working areas freely. The mobile gantry crane can lift with a variety of capacities to cover the most applications of customers. The portable shipyard gantry crane provides an easy transportation, wide lifting coverage, flexible movement and simple operation, making it a popular option for many crane users. 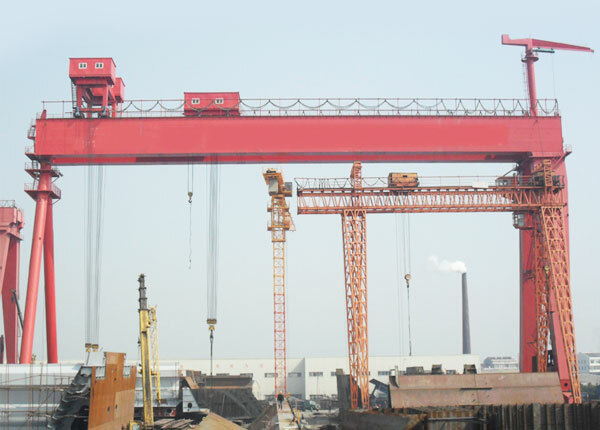 Our shipyard gantry crane adopts optimized design and construction so as to ensure the quality of the equipment. As an efficient lifting tool, it brings numerous benefits to crane users. The unique metal structure design with welded girder construction provides a lighter weight as well as a higher degree of rigidity. It also has small wheel pressure. The shipyard gantry crane is usually controlled by an operator from the control station, greatly reducing risks of serious and even fatal accidents. Besides, some reliable safety devices such as wind proof device are equipped to prevent strong winds or storms. The reasonable and optimized structure helps prolong the work life of the equipment. 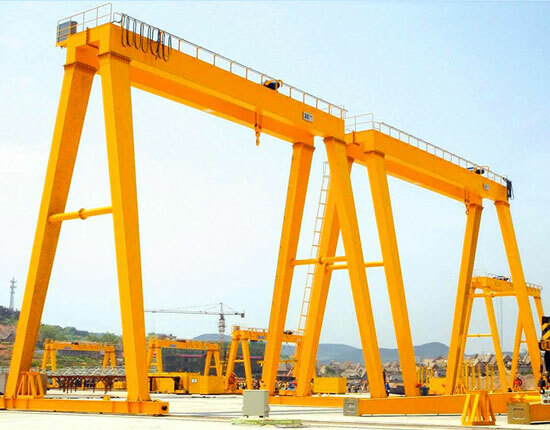 The gantry crane components and parts are all sourced from reputable suppliers, and they have great exchangeability. In addition, some protection devices such as anti-swaying device are available to ensure a stable and reliable movement. 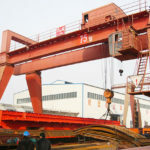 The shipyard gantry crane also requires minimum maintenance. The equipment generally runs with low noise. The commodious cab design provides a wide field of vision and accurate operation. For both rail mounted and rubber tyred type gantry cranes, they can make the most of working areas and achieve a large coverage. 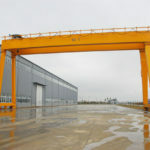 The shipyard gantry crane is also adaptable to various workplaces. The safety concerns must by addressed during shipyard crane operation in order to prevent accidents. 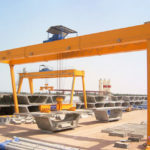 The shipyard gantry crane is usually operated by a crane driver sitting in the cab room, and the crane operators must be rigorously trained on the heavy duty crane knowledge and the specific equipment they are going to deal with. Besides, due to the limitation of vision from cab room, a co-worker from the ground is usually required to assist the driver in the crane operation. The crane cabin we design is with commodious feature, which provides ease of operation and good vision for operators. As shipyard cranes are large in size and capacity, we have done a lot of hard work to ensure the equipment safety from several aspects, including design, manufacturing, delivery, installation and maintenance. Besides, the crane users should pay more attention to the safety issues to prevent human errors and component malfunctions. For instance, the operators should strictly follow the operation rules and regulations, and in case of component failure, a timely maintenance or replacement should be done. We hope everyone involved in the crane operation will be safe and sound. To learn more about safety concerns, consult our engineers online now. 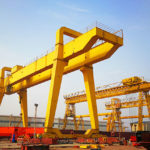 Which Shipyard Gantry Crane Manufacturer Is Right For You? 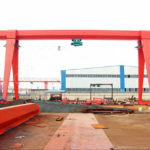 When looking for a shipyard gantry crane, a lot of buyers may be a little overwhelmed with so many shipyard gantry crane manufacturers and suppliers. However, it is very important to choose the right manufacturer for that it is highly related to the efficient operation of your business. 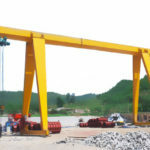 Before considering the specific type of shipyard gantry crane, we suggest you to think about a few questions in order to narrow down suppliers for your gantry lifting system, things like do the suppliers have related qualifications and certificates such as ISO and CE, how long have they been engaged in the industry, and how do they fabricate their gantry cranes. After considering these questions, you can narrow down your lists of suppliers. Then you can think about your specific requirements for shipyard gantry crane to make the best choice. If you have any need for gantry lifting system, we highly recommend Ellsen, a seasoned gantry crane manufacturer and supplier in China. We have been engaged in material handling industry for decades, and have a wealth of experience in designing and manufacturing lifting equipment. We supply a variety of cranes to server almost all needs of customers, including overhead crane, gantry crane, jib crane, hoist and winch products. We have set strict quality control system and assurance system to improve product quality. Our goal is to bring maximum satisfaction to clients by means of providing quality products and reliable services. 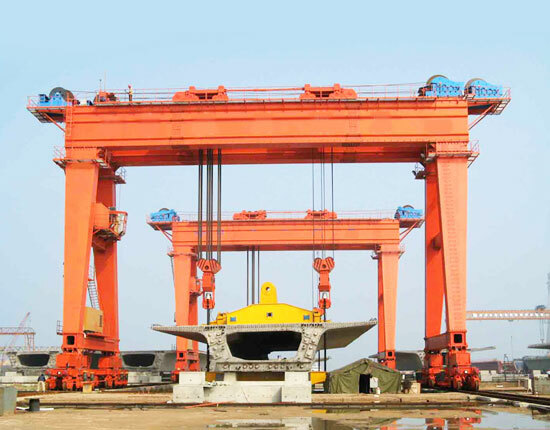 To know more about shipyard gantry crane, contact us today. Our professional sales team and engineers will be very pleased to help you in the whole selection process.